400 amp rated rotary electrical device. Instant use with any cable length unwound. Easy access and greaseable zerk fitting. Four-way roller assembly. Roller position must be specified. Gear driven crank rewind, chain and sprocket powered by an electric, hydraulic, or compressed air motor or spring rewind. Auxiliary rewind and pinion brake standard. Chain guards are available, must be specified. Weights shown in chart are for crank or spring rewind models. Add 40 lbs. for power rewind. 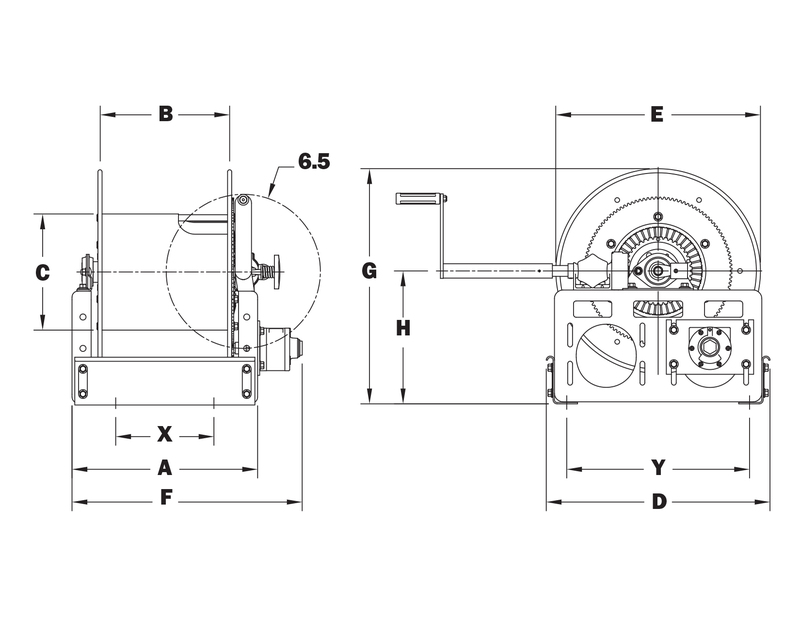 When ordering power rewind Series WCR, prefix model number with: A = Air Rewind; EP = Electric Rewind; HD = Hydraulic Rewind. Air rewind reels are supplied with control valve and 18" air hose; 12v and 24v DC rewind reels are supplied with switch and solenoid; 115v AC rewind reels require double pole single throw switch which is not supplied but can be ordered separately; hydraulic rewind reels are not supplied with control valve.